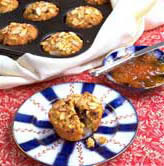 Delicious muffins fortified with flax seed meal and whole oats. Flax Seeds are a plant based source of omega 3 Fatty acids, a type of polyunsaturated fatty acid that retards inflammation and is thought to reduce the risks of many diseases. Preheat oven to 350Â°, Spray muffin cups with oil In a medium bowl combine the pastry flour with the oats, corn meal, soy flour, flax seed meal, baking soda, baking powder, cinnamon, and salt Stir in the cranberries and set aside. In a large bowl, mix the applesauce with the sugar. In a small measuring cup, whisk together the egg replacer powder with the water until foamy. Add to the sugar mixture with the soymilk. Make a well in the center of the dry ingredients and quickly fold in the applesauce mixture. Pour into prepared muffin cups and sprinkle tops with sliced almonds. Bake 20 minutes, or until tester comes out clean. Protein 4g, Carb 32 g, Fiber 3g, Fat 3 g, Chol 0.0mg, Calcium56mg, Sodium 147mg. Protein 6g, Carb 37 g, Fiber 3g, Fat 15g, Chol 61 mg, Calcium 69 mg, Sodium 291mg.